In 1873, R. Cameronof Lancaster,Ontario, was given the contract to build a lighthouse at Metis. Cameronhad already built several lighthouses along the St. Lawrence near the Thousand Islands. The construction cost $3518 of which the lighting and accessories accounted for $1425. The lighthouse was built of wood and was 40 feet high. The Light tower was made of iron and 7 1/2 feet in diameter. Judge Thompson House is a superb survivor from the first half of the nineteenth century. Overlooking Gerard D. Levesque Boulevard in New Carlisle, the house dates back to c.1838 and is one of the oldest buildings on this part of the Gaspé Coast. Gaspé, the scene of many historic events across the years, witnessed dramatic events in September 1758. The great French fortress of Louisbourg had surrendered to the British forces in August. An expedition was then organized and dispatched to Gaspé to destroy French settlements and shipping in the Gulf of St. Lawrence. Sir Charles Hardy and Brigadier-General James Wolfe were in command of the naval and military forces respectively. 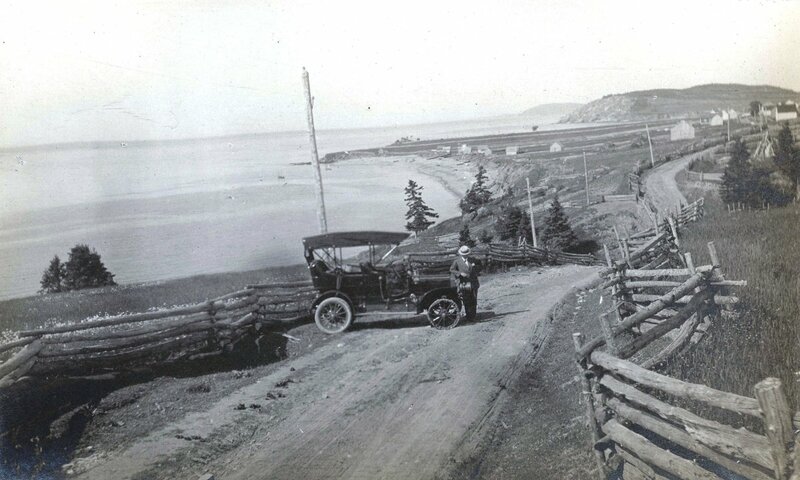 In the summer of 1909, a remarkable automobile journey was made from New Carlisle to Roche Percé. It would be considered ordinary today, hardly noteworthy even if travelling in an antique car. Gesgapegiac is a Mi'gmaq community situated along the south Gaspé coast just east of Maria, Quebec. The place-name "Cascapedia" (as in, the world-famous Cascapedia River) is actually a derivation of the name "Gesgapegiac," which is Mi'gmaq for "last land." One of the finest examples of mid-nineteenth century architecture on the Gaspé Coast is the mansion known as Hamilton Manor. Though the name of Frederick James Richmond continues to be recalled annually to the youth of Gaspé through the award of the Richmond scholarships, established by his brother George, the life and influence of this remarkable Gaspesian has faded with time and the passing away of those who knew him personally. Sweeping social changes have so altered the society of his native town of Gaspé that much of its earlier English heritage may soon be forgotten. In October 1675, more than three centuries ago, Father Chrestien Le Clercq, a missionary of the Recollet or Reformed Franciscian Order of France, landed at Percé in Gaspesia. The story of the life of Felix O’Hara and his family is linked so inextricably with the early settlement of Gaspé Basin and with events in the District of Gaspé that it is unusually significant. The following attempt at recall of the family story reflects various, widely scattered records. One vital source of information was not available – that of Church records – for Gaspé had no Protestant clergy until long after the death of Felix O’Hara in 1805.The visitor to modern Gaspé will find no civic memorial to Felix O’Hara. Forillon has been inhabited for a long time. Nine thousand years ago, prehistoric peoples camped on the capes lining the point, the marine terraces of the Anse au Griffon Valley and Penouille Point. For centuries, the coves and pebbled beaches of the Gaspé Cape in Petit-Gaspé had attracted the Micmacs, the first inhabitants of Gaspé, seasonal and sedentary fishers. The largest coves, such as Anse aux Sauvages, Saint-Georges Cove and Grande-Grave had villages established near them. Smaller coves welcomed family settlements.